I was unaware of these Hood forums. I have collected them for a couple years now. Picked up a hollow grind thug a couple weeks ago. My user. Making leather sheaths also as a hobby. Welcome to the forum, glad to see you here. Thank you. Curious if the pictures showed up for you? Yes, the pictures showed up nicely. Yes, nice pics, thanks... Welcome aboard! If you haven't seen them, you might also look at the Hood's DVDs, some great training video. Welcome to the campfire! 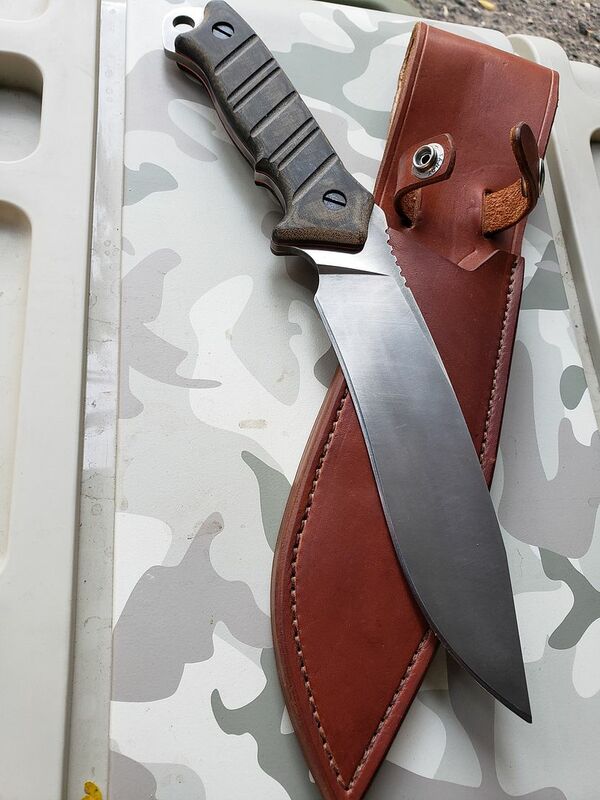 Nice looking sheath. Check out the vids. Great info. Welcome friend! Yes I was (and still am) simply ecstatic about the Hoodlums forum, their magazines, merch and videos--they are my greatest survival resource and best entertainment! 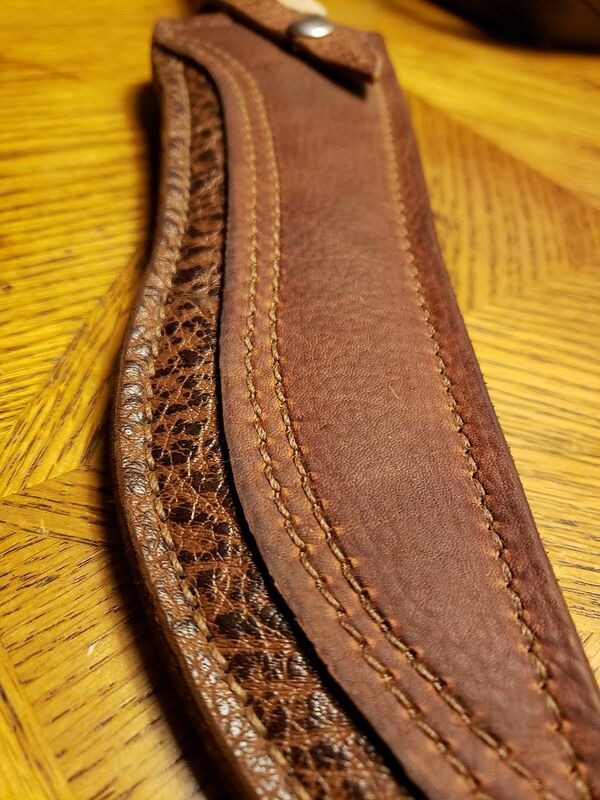 Is that leather sheath for your "user" one that you made yourself? Nice collection! I picked up Karen's last knife at the local shop and fondled it for a bit. It sure felt superior to so much garbage that's for sale now. It just felt like it was made for the wilderness! Thanks for joining us. How did you get a "Bootlegger"? That was supposed to be the last knife in the series but Buck pulled the plug on them. I didn't know they had any actually made. I had only gone in to approve the prototype..... It was only month's after that, I found out that the head of the Co. had authorized giving all employees there one of them for their Christmast Gifts. And I didn't get ONE from them. After one of my good friends at Buck found this out she gave me hers and said "Karen, you deserve this!" She was so sweet. She was not aware that I was left out of the loop on this decision. It really left a bad taste in my mouth. Then month's after they gifted their employees the blades, I had to endure watching them one by one post them on EBAY - selling them for exorbitant amount using Ron's name and my company name,Hoods Woods, to make a few bucks on us! I didn't see ONE dime from them! Not a good way to handle a business relationship with a widow! Anyway - rant off. I am over it. But it was "dirty pool" and was handled poorly in my opinion. Was not a good note to end on after my (I though was good standing) relationship with that company. (09-28-2018, 12:36 PM)Tn Ridge Rover Wrote: Nice collection! I picked up Karen's last knife at the local shop and fondled it for a bit. It sure felt superior to so much garbage that's for sale now. ........................................ But it was "dirty pool" and was handled poorly in my opinion. Was not a good note to end on after my (I though was good standing) relationship with that company. (09-29-2018, 05:58 PM)Karen Hood Wrote: Sorry to hear about anything that may of happened over there with this little gem of a knife. I picked this one up off craigslist. I knew they had been on the bay now and again for quite a bit of money. 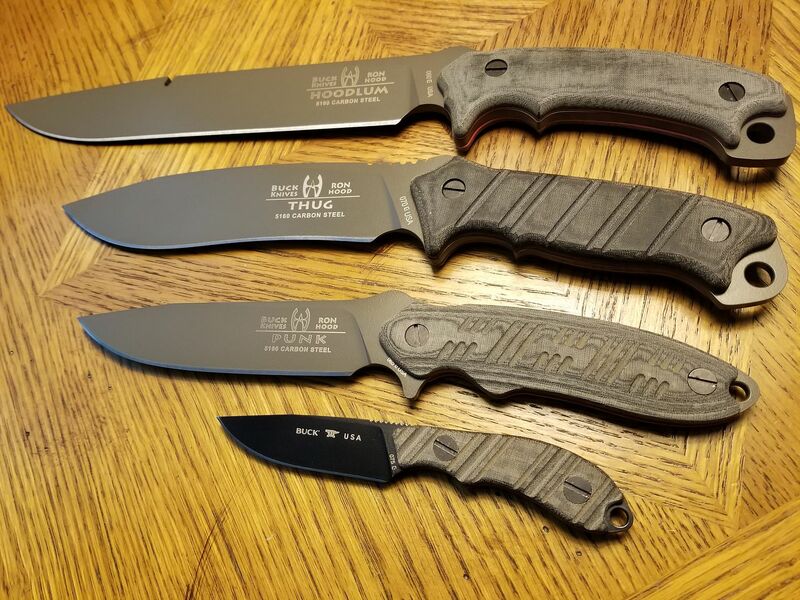 Too bad, I really thought this line of knives were some of the best out there. I have a few sets of the original 3 to keep because I love them. My kids will enjoy these long after I'm gone. Yes I make the sheaths. Pure hobby but I enjoy it.